College of Physics, Chongqing University, Chongqing, China. We initially look at a nonsingular universe representation of entropy, based in part on what is brought up by Muller and Lousto. This is a gateway to bring up information and computational steps (as defined by Seth Lloyd) as to what will be available initially due to a modified Zero Point Energy formalism. The Zero Point Energy formalism is modified as due to Vissers’s setting of an angular plane number in early universe cosmology as k(maximum) ~ 1/(Planck length), with a specific initial density giving rise to initial information content which may permit fixing the initial Planck’s constant, h, which is pivotal to the setting of physical law. This will be in the spirit of Stoica’s removal of initial conditions of non-pathological initial starting points in Cosmology. What we want are necessary and sufficient conditions so h(today) = h(initial). We also in addition make a brief survey into 5th force arguments in gravity which also has a strict entropy interpretation. i.e., how to link gravity, quantum mechanics, and E and M through entropy production. 1. Introduction: Can h(Today) = h(Initial)? And What Is the Link of Quantum Mechanics, Classical Mechanics (Gravity) and Electromagnetics via Early Universe Entropy? cosmological equation of state of the universe, is proportional to a with a called the scale factor  , as of page 3 of  , which is a function of time which represents the relative expansion of the universe. Also, considering the elaboration given in  , we do a basic working definition of what a scale factor is. One of the questions which have come up in discussion is what is meant by the term scale factor. In Cosmology, a as a scale factor is nearly zero at the start of the universe expansion, and equals 1 in the present era. In this case, a starts with a value just above zero, and obeys the cosmological Friedman equations. Scale factors are used as a convenient measuring convention in part in that the actual radii of the universe, and how it expands are controversial. By way of   , we will have the following. This will be compared to another time step (2) based on  . Doing so will then permit us to make further use of  and its relationship between a cosmological “constant” and an upper bound to the number of produced gravitons. The upper bound to the number of gravitons as given will be discussed as a way to ascertain if the cosmological constant, as given in Equation (5) evolves over time. While here, will briefly allude to what the Cosmological constant did earlier and its role in present cosmological theory. As given by  the cosmological constant was put in place by Einstein in order to have a static universe. A static universe says that the universe no longer expands or contracts. That it is spatially not changing, in size over time. That there would be no situation where there would be a changing scale factor, i.e., to consider what this means look at the Equation (6) below. For the sake of understanding what G is, we could for the sake of argument, invent a cosmology for which , with to be defined as below as in the fifth force arguments, i.e. as the value of a gravitational constant at the far distance between two masses, call them . We will elaborate upon that identification of at the end of the introduction, but we will in general identify G namely as the strength of gravity, and ignore situations for which G may vary over time, as given in  . For now if G is the strength of gravity, and invariant, we will further state what this to expect about the cosmological constant. The other situation which will comment upon is a situation for which the “cosmological constant” may in some sense vary over time, i.e., an easy example will be given below by using reference  , where the number of gravitons, as a measure of entropy, will be connected with the “cosmological constant”. in Equation (12). It is closely tied into what is calculated as of Equation (18) below, a one meter or so initial radii, for . In addition we will make the following identification of entropy with the following fifth force argument. The two arguments about entropy will be re enforcing each other, and we will talk about what the two entropies portend to, in our conclusion. So as this is the introduction, before we go to develop the first part of our introduction, we will briefly access 5th force arguments here. This fifth force argument and what it portends to, will be compared to the main developed argument given above, in terms of its effect upon entropy, in the conclusion. The generalized charges, Q, as brought up are defined, briefly in Equation (13) in the next few lines, whereas the term is a range of a presumed 5th force, with, as given by  is ~1000 to 2000 meters in length, whereas if we look at the masses are frequently of values of 1 GeV/c^2, i.e. ten to the ninth electron volts, i.e. obviously if we were identifying gravitons, that they would, if they had any mass be massively accelerated almost to the speed of light, and that due to the rest mass of a graviton usually identified as to be about 10^−62 grams, or about 5.5 times 10^30 electrovolts/C^2. As given by  . In addition the term as given in Equation (13) (7) as which is the value of the interaction between the two masses as the spatial distance between them goes to infinity. are the masses of Equation (14) with the following relation given to the author by Unnishkan when he gave   as a way to link gravity with electromagnetic forces. This note, given to the author has some similarities to  as given by Ciufolini and Wheeler. We argue that the linkage of Equation (16) of magnetism with mechanics, and by default gravity, is similar in part to what Ciufolini and Wheeler wrote up in  as their work with the initial value problem in Einstein Geometrodynamics, pp 271-314, and this connection will be further explored in follow ups in our research. Keep in mind what  is referring to which has some analogies to our work is on page 280 of their book in a read starting under the title “Hilbert Choice of Action Principle Supplies Natural Fixer of Phase for Getrodynamics” with page 287 then getting very close to our work, under the Heading “An interpretation: The Analogy with Electrodynamics”. In particular the feed into the page 288 Equation (5.2.29) in  is in spirit very close to what we are doing here, a similarity which will be explored in future publications. We will elaborate upon this treatment of entropy in our derivations, and compare this behaviour of entropy in the first part of our introduction, which is for coming up with entropy as far as a way to confirm if or not we can preserve Planck’s constant, from cycle to cycle of presumed universe creation to its collapse (if that happens) plus its recreation (recreation of the universe after collapse). The significance of linking E and M, Classical Mechanics, Quantum processes, and entropy via 5th forces will be in showing the unity of entropy production of classical (gravity) predictions, QM, and electromagnetics in terms of how we could maintain the constancy of physical law, due to evolution equations of physics which would have invariant physical constants, i.e. no change during cosmological evolution. 2. Calculations as to Entropy, and What It Says about Bouncing, versus Non-Singular Universes? The term non-singular universe is short hand for an initial starting point as to the expansion of the universe which is not at a singular point of space-time. Reference  begins with this supposition, as well as does   i.e. the quantum bounce idea of Loop quantum gravity. Keep in mind we are also using the Non-Linear Electrodynamics non-zero singularity which is also a nonzero bounce for the start of the universe   . Having said that, such effects do seem to tie in also with work the author has done in  which is in its own way a partial confirmation of  as a starting point. We will use this while assuming in our calculations does not go to zero. In this paper, this radii, is similar to what is done in black hole physics, as is noted by  , and gets to the heart of the entropy calculation. That we are modeling the acquisition of initial nonzero entropy in the universe with a one to one equivalence with black hole physics is what motivates the rest of this paper. In doing so, we will urge more advanced readers of this document to access  to get an idea of how tricky this initial condition stuff in early universe cosmology actually is. For the record, the usual interpretation of in terms of black hole physics, is in terms of what is called an event horizon. An event horizon is a boundary in space-time beyond which events cannot affect an outside observer, i.e. in black hole physics, once a person passes through this radial distance from a black hole, it supposedly is such that the observer cannot escape the pull of the black hole gravity gradient. So, we will assume a linkage between black hole physics event horizons, as defined, and early universe cosmology in the manner brought up by  . The specifics of what were done with , is what will be discussed in this section, and Equation (1) has its counterpart as given by, if R is the radius of a sphere inside of which harmonic oscillation occurs, and is in this case is of a different value, i.e. generalized Harmonic Oscillator based lattice spacing  . 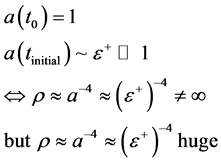 The main import of Equation (20) is that it defacto leads to a “non-dimensional” representation of entropy, but before we do that, it is useful to review what is said about . As defined in  , is called the maximal co-ordinate distance a photon can travel in space-time in a given time, t.
FWIW, we will provisionally in the regime of z (red shift) > 1100 set for inflation from a Planck time interval up to 10^-20 seconds, when the expansion radii of the universe was about a meter, i.e. What we will do in later parts of this paper, to get an approximation as to what the actual value of is, and to use this to comment upon the development of entropy. Cai, in  has an abbreviated version of entropy as part of a generalized information measurement protocol which we will render as having T.F.A.E. and M field given at the start of creation itself, and of course a cosmological “constant” parameter , with the following linked to a minimum scale factor, i.e. if we look at Camara  , keeping in mind that c is the speed of light and that G is invariant. A specified value of will also be ascertained, in this document. We set it equal to 1, and then calculated the other values from there. From the above, we will specify a variance graviton mass, a minimum time, according to the above, and work out full consequences, with suggestions for finding exact values of the above parameters. 3. Filling in the Parameters, What It Says about Initial Cosmological Conditions? Using inflation, this would be redshifted at a minimum of 11 orders of magnitude, down to about 10^10 Hz today, at the highest end. The nature of the E and B fields, also as fill in would have to be commensurate with what was given in  . Still though, as a rule of thumb, we would have that the MINIMUM value of the magnetic field, in question would have to be  , i.e. for high frequencies, the minimum value of the magnetic field would actually be very low! 4. 1st Part of Conclusions: Why We Have a Non-Zero Initial Entropy, and How to Unify the EM, QM, CM, Gravitational and Other Variants of Entropy? The upper part of Equation (38) overlaps, a bit with Equation (37) whereas Equation (36) is only a few orders of magnitude higher than the formal numerical count for the number of operations, # of Equation (39), i.e. the number of bits, given in Equation (39) is similar to the graviton entropy count given in Equation (32), However, most tellingly, the initial non zero graviton count, given when the universe is 1 meter in diameter, or so, is initiated by negative pressure, which we recount, below. In addition, making use of the above calculations, if we do so, we obtained that the minimum time step would be of the order of Planck time, i.e. of about 10^−44 seconds, which is very small, but not zero, whereas, again, assuming a 1 meter radii, which we obtain at the end of inflation, with a time step the, at the end of inflation of 10^−20 seconds. This is significant, when the universe had a radii of 1 meter, is about when we would expect r to be about 1 meter to then get us a value of Equation (42) in upper bound, i.e., setting r about 1 meter would allow us to have to have the upper bound value of Equation (41) being that of Equation (36). This set of number of operations would be about when we would expect Planck’s constant to be set, with the values as given in  . tial entropy, i.e., bits, it would be possible to have . We include below the derivation of Equation (43) which is for showing the following equivalences given in Electromagnetism, Quantum Mechanics, Classical Mechanics, and Gravity, through foundational Entropy at the Pre-Planckian level. Equation (43) is a direct result of the following derivation, namely see the below, with Q, here, a fifth force quantity. We should, here, keep in mind that that abbreviation of H.O.T. means higher order terms. Sometimes they are extremely important, and other times that happens not to be the case. following are equivalent and imply each other as given in the grouping called Equation (43). This all is in keeping with  . Keep in mind that in reviewing Equation (57) especially, that we should keep our final results in fidelity with  and to delineate what is correct in  and what we are building upon, as a possible augmentation to Einstein’s great insights. In  , there is a reference as to “stochastic background radiation of a primordial nature or resulting from the superposition of a large number of individually unresolvable sources”. What we are doing with Equation (57) and Equation (58) is to find conditions for identifying stochastic radiation of primordial origin and to avoid the multiple sources. To a large degree, this is the basic motivation of our fifth force inquiry. In addition, it requires getting the input from Equation (55) as to a primordial magnetic field correct, and that to avoid the problem of Bicep 2, in which dust messes up the gravitational waves. To aid in that, the frequency associated with the magnetic field, in Equation (55) as well as measurements in graviton counts, as may occur in a correct reading of Equation (44), as a graviton count per unit area of space, have to be done in adherence to  , as well as the inputs of coupling between electromagnetic fields from the primordial processes referred to in this document. also is important in this investigation as to investigating our claim that the interferometric tests for the fidelity of our model with measurements as to  will be aided by correct evaluation of Equation (44), Equation (55) and of course Equation (57) and Equation (58), i.e. the existence of explicit 5th force arguments will aid greatly in determining the choice of either general relativity or Scalar-Tensor theories of gravity as the origin of early universe primordial gravitational wave, and/or electromagnetic phenomenon. We assert that since  conflates early universe conditions with stars, that an early universe condition equivalent to the redshift of reference  will appear, and that it will be important in terms of making certain our signals, are primordial and avoid the trap is mentioned in  of stochastic background due to multiple signals. Same as in  . A correct reading of redshift, and its NLED contributions, for gravitational physics are a datum which should be investigated carefully so as to keep the problems of  vintage, especially avoiding contamination of the early universe signals with the BICEP 2 multiple sources problem. Equation (44), Equation (55), Equation (57), and Equation (58) are relevant to a counter part to the Born-Infeld NLED section of reference  . In particular, note that  has a long Section 3.2 which delineates constraints upon the magnetic field for what is called in  an effective metric. We can use a derived magnetic field we have in our document in lieu of the “Equation (32) and Equation (33) and Equation (34) and Equation (35)” of  to come up with a similar analysis for our early universe conditions. When done, we hope that this work will also enable a deeper inquiry as to what Corda raised in reference  as a procedure to investigate the fidelity our work with one of the models of gravity prevalent in the cosmology community as well as its fidelity or divergence with the outstanding work done by Einstein in reference  . While using fully the methodology given in  to full effect. This work is supported in part by National Nature Science Foundation of China grant No. 11375279. Beckwith, A. (2016) Non-Linear Electrodynamics Gedanken Experiment for Modified Zero Point Energy and Planck’s “Constant”, h Bar, in the Beginning of Cosmological Expansion, So h(Today) = h(Initial). Also How to Link Gravity, Quantum Mechanics, and E and M through Initial Entropy Production in the Early Universe. Journal of High Energy Physics, Gravitation and Cosmology, 2, 168-182. doi: 10.4236/jhepgc.2016.22016. Cai, R.-C. (2005) Some Remarks on Constant Curvature Spaces. In: Liu, K. and Yau, S.-T., Eds., Superstring Theory, Higher Education Press, Beijing, 234-250. Jack Ng, Y. (2008) Space-Time Foam: From Entropy and Holography to Infinite Statistics and Nonlocality. Entropy, 10, 441-461. Camara, C.S., de Garcia Maia, M.R., Carvalho, J.C. and Lima, J.A.S. (2004) Nonsingular FRW Cosmology and Non Linear Dynamics. Arxivastro-ph/0402311 Version 1. Weinberg, S. (2008) Cosmology. Oxford University Press, Oxford, 3. Schutz, B. (2003) Gravity from the Ground up: An Introductory Guide to Gravity and General Relativity. Cambridge University Press, Cambridge. Visser, M. (1996) Lorentzian Wormholes, from Einstein to Hawkings. AIP Press, Springer Verlag, Baltimore, Maryland. Walecka, J.D. (2008) Introduction to Modern Physics, Theoretical Foundations. World Press Scientific Co, Pte. Ltd., Singapore, 596224. Grupen, C. (2005) Astroparticle Physics. Springer-Verlag, Berlin. Peebles, P.J.E. (1993) Principles of Physical Cosmology. Princeton University Press, Princeton. Fishbach, E. and Talmadge, C. (1988) The Fifth Force: An Introduction to Current Research. In: Fackler, O. and Tran Thanh Van, J., Eds., Fifth Force Neutrino Physics, VIII, Moriond Workshop, Editions Frontiers, Gif-sur-Yvette, 369-382. Fishbach, E. and Talmadge, C. (1999) The Search for Non Newtonian Gravity. Springer-Verlag, Heidelberg. Ciufolini, I. and Wheeler, J.A. (1995) Gravitation and Inertia. Princeton Series in Physics, Princeton University Press, Princeton. Barret, T.W. (2008) Topological Foundations of Electromagnetism. World Scientific Series in Contemporary Chemical Physics, Vol. 26, World Scientific, Singapore. Beckwith, A. (2011) Is There a Generalized Way to Represent Entropy? Prespacetime Journal, 2, 737-742. Galloway, G., Miao, P. and Schoen, R. (2015) Initial Data and the Einstein Constraints. In: Ashtekar, A., Berger, B., Isenberg, J. and MacCallum, M., Eds., General Relativity and Gravitation: A Centennial Perspective, Cambridge University Press, Cambridge, 412-448. Einstein, A. (1917) Cosmological Considerations in the General Theory of Relativity. Sitzungsber. Preuss. Akad. Wiss, Berlin (Math.Phys. ), 1917, 142-152.